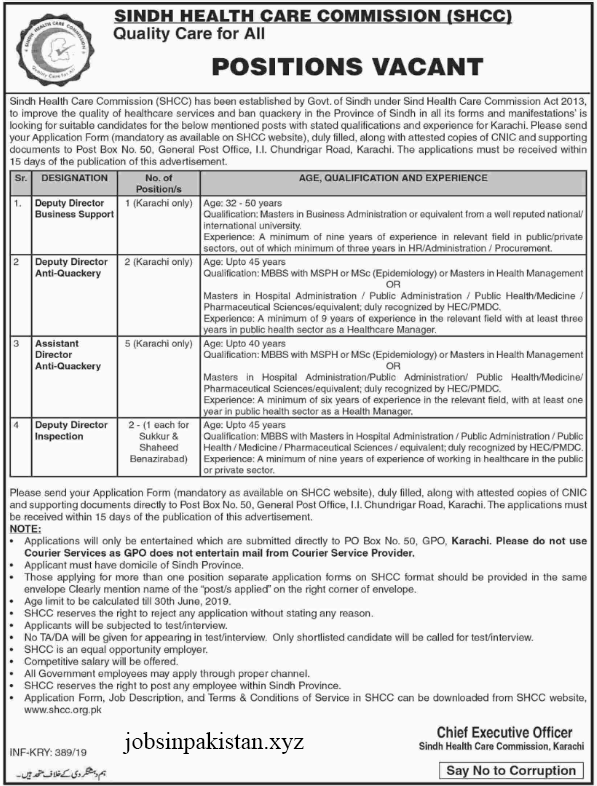 Jobs Description: Sindh Health Care Commission Jobs February 2019 are listed below in our site. The Government of Sindh recently announced an advertisement for Jobs in SHCC (Sindh Health Care Commission). Sindh Health Care Commission (SHCC) has been established by Govt. of Sindh under Sindh Health Care Commission Act 2013, for improving the quality of healthcare services in the Province of Sindh. Sindh Health Care Commission has required the applications for following jobs. How To Apply: Application form is available on SHCC (Sindh Health Care Commission) official website. The interested candidates may send their applications to P.O Box No. 50, GPO, Karachi.